Ocean Sdk Tutorial 3 – Musings of a confused technology addict. XML has established itself as the de facto information exchange format and technology in many fields of software. It certainly has its problems, but without going into comparisons with alternatives or discussions of what works fine and what does not, it it possible to say that XML provides a lot of tooling along with a massive adoption across programming languages and platforms. XML Schema, XSLT, XPath, XQuery are some of the powerful tools available to users of XML, and they have been widely implemented with strong tooling support just like XML parsers. A key requirement for almost all clinical applications build on openEHR is to be able to talk to other systems and layers. Other system here does not necessarily mean a piece of software that belongs to another party. It is quite common that same clinical system may use different technology stacks for various reasons and the assumption of a homogeneous, monolithic application is not realistic anymore in today’s software development environment. Therefore, the requirement to move data across layers in an application or across applications is a significant one and Ocean stack provides strong support for XML to respond to this requirement. The use of XML for representing openEHR data is not an Ocean Informatics specific approach. XML is strongly supported by the openEHR foundation and there is a set of XML schemas published by the foundation. These schemas allow well defined and shared representation of many important components of the openEHR specification. Both during the communications amongst implementers and in this text, this foundation supported and released XML format is called the canonical XML form. The canonical XML guarantees that as long as implementers are able to produce and consume this XML (which complies with the canonical schemas), information can be shared across systems. Moreover, if you develop a clever piece of technology such as an XSLT transformation that creates an HTML display out of a Composition’s XML form represented as canonical XML, your implementation will work on outputs of all openEHR implementations. If you write a transformation from an HL7 message to an openEHR Composition in canonical XML form, all systems would know how to consume the outputs of your transformation. There are many use cases where having an agreed XML schema set helps. Given that it can be quite useful, there are various ways the stack provides support for XML, ranging from serialisation to full artefact generation for software development and the following sections will cover these options. Let’s start with the basic requirement: we have an openEHR Composition at hand and we would like to send it to another point. The Composition is a key type in the openEHR specification as we’ve discussed. It can almost be described as the de-facto document/unit that represents a clinical concept, so it makes sense that it may be passed around. For example, you may be sending clinical data of a patient to some other software which will display them on the screen. Both systems agree to use the canonical XML as the data representation format and you are given a patient id for which you’re supposed to provide a Composition. We’ve seen that we can easily run AQL or use an API call to get back a number of Compositions, so the only step that we would need to take would be to produce canonical XML output of those compositions. Let’s see how we can do this. The story up until line 13 should be familiar to you by now. Create an EHR for a patient. Get a TDO instance with some data, persist it, then read it back into a variable ( c ) This is a mini version of a major use case for your system: creating data and reading it back. Now we want to get an XML representation of the variable c. Line 17 is where the magic happens. All we need is an XmlWriter instance, which is a build in .NET framework type. This instance is created between lines 14 and 16 and then the variable c is provided along with XmlWriter instance to a static method that is provided by the Composition type’s implementation in the Ocean stack. at line 18, we get the XML we’re looking for as a string. Then at line 19 we create an XmlDocument instance, again a type provided by the .NET framework, and load it with the string form of XML (line 20), which we then save to disk at line 21. We could have used the string directly in many cases, but handling XML data properly can be tricky. Writing it to disk in a pretty format, or sending it over the wire as response to a web service call may require some attention to make sure XML stays as valid XML. XmlDocument is a convenient type that lets us do many things safely, and both Ocean’s implementation of XML related functionality and XmlDocument’s functionality are really fast (a few milliseconds at worst for many operations) so its use is encouraged. Line 23 demonstrates what the recipient of the XML output could have done if they were using the Ocean SDK: other than the call in line 27, this is all standard .NET XML processing and Line 27 is simply calling the Deserialise static method on Composition type to arrive at a Composition instance. This function actually shows a lot: creating the EHR, the clinical data, persistence to CDR, querying back, how information can leave your system in a well defined format (the act of saving XML to disk) and how you can pull it back in (reading from the disk). Now let’s see other use cases around XML capabilities of Ocean stack. The knowledge repository service from Ocean stack is instantiated at line 8 and it is used at line 12 alongside an XmlWriter from the .NET framework standard library to let TDO instance pTdo create an XML representation of itself. The rest of the method is responsible with resource management and error handling. The deserialisation method for TDO in the Ocean SDK is even simpler and we won’t cover it here. Let’s see how these functions could be used if you’re using the SDK. Line 1 calls the now familiar CreateTDO method that has been giving us our test TDO instance all along the tutorial. Line 2 is calling the SDK method we’ve just discussed and as in the case of Compositions and XML related functionality, we’re using an XmlDocument instance up until line 10 where we call the Deserialize function from the SDK. Note that we’re deserialising the xml payload from the TDO serialisation into a Composition instance comp (declared at line 7). This is just a minor reminder to show that a TDO is a convenient form of a Composition and we can switch between the two using either API functions as we’ve done before or even XML serialisation/deserialisation. If you go back to XML and Compositions section and take a look at the use case we’ve discussed there, you can see that thanks to XML based deserialisation to TDOs, you can actually work with TDOs on both sides of the communication in that scenario and pass around XML which is actually a Composition. So same XML payload can be deserialised to a Composition or to a TDO. Line 14 demonstrates this by deserialising the XML payload into a TDO. So the real benefit of XML support for TDOs is that it lets you work with your TDO based interface and when it is time to share that information with another system, you can simply use the XML serialisation and deserialisation features to keep using your interface, regardless of what happens to data outside of your system. Speaking of communicating with the outside world, it makes sense that we discuss the extend of XML functionality supported in the Ocean stack in the context of web services. For the last few sections of this tutorial, we’ve been discussing the idea of sharing information with other systems using XML and our examples so far have been rather simplistic with the goal of focusing on a particular feature and not complicating things with discussions of how XML gets shared, that is the mechanics of moving XML around. XML Web services have risen to strong dominance in the information systems implementation domain ever since 2000s and even though there is a big shift towards use of simpler implementation methods such as REST, there is still a large user base and tooling for XML Web services. Web services integration of the Ocean SDK will be covered in its own section but there is one aspect of Ocean Stack that enables this integration which we’d like to mention at this point where we’re talking about XML serialisation for Compositions and TDOs. A key feature of the Ocean stack is that its result set from AQL queries can be cast directly to a ResultsTable type. The ResultsTable type is capable of seamlessly deserialising itself when used as a return type of an XML web service. This means that you can write code that will use AQL and the results can be directly serialized to XML and send over web services to any client that is capable of consuming XML web services. As of today, all major programming languages and platforms have some support for this, which means that you can provide the results of your queries to many other technologies and stacks out there with very little effort. Moreover, if your result set is returning compositions or other complex types from the openEHR reference model (RM), the XML that is generated for web services communication is canonical XML, which means it will be valid according to published XML schemas. This brings all the advantages of XML discussed before in a distributed, platform independent communication setting, which will be covered in detail later in the tutorial. Up until now, we’ve focussed on TDO mechanism as an option for representing clinical models in the software development context. It is true that the TDO option helps developers manage the clinical logic, but it is not the only option the Ocean stack provides. The Template Designer has a mechanism called the Template Data Schema (TDS from now on) which is similar to TDO, but uses XML instead of C’# as the target for autogeneation of artefacts. XML Schema is a mechanism that enables XML documents to conform to a set of constraints. The schema (XSD) allows definition of valid documents using a type system which includes basic data types and also the capability to compose complex types out of basic types. This capability has enabled XML to become a convenient data representation formalism for many types of data used across different systems. The Template Designer uses this capability of XML to create a mini type system within an XSD that represents an openEHR template. Template Designer has an option to export a template to a Template Data Schema (TDS from now on) which is an XSD which is automatically generated based on the template. Focus on the Comments and DrinksEveryNight fields. The TDS is a good old XML Schema (XSD) but you can see that it looks more comprehensive and detailed compared to the template in the template designer. This difference is due to UIs of the two different tools used. The Template Designer does not display everything on the main UI area and it also does not expose every element and attribute of the RM. Still, you can see that the TDS is an XSD based on the template. Every TDS creates its own mini type system using the XSD type system capabilities. The obvious question is why? The TDS is designed to be a messaging convenience. It lets you turn a template into a self contained XML document with its schema so that it can be validated. So the original design goal of the TDS is to establish a messaging mechanism between openEHR implementations. You may be concerned about the per template based XSD type system, but it is not entirely disconnected from the canonical XSDs from openEHR foundation. Whenever it is possible to do so, the TDS type system reuses types from the canonical XML representation of openEHR specification. There is also another tool at your disposal which makes TDS an option that can go well beyond messaging between openEHR systems in terms of its benefits. An actual instance of a TDS is an XML file. This XML file, which must be valid according the TDS, is called a template data document (TDD). There is a publicly available XSLT transformation that can transform a TDD to an XML serialisation of a Composition. This mechanism is the answer to the obvious question that you were probably just about to ask: what happens when a TDD arrives at an openEHR implementation? We need a method to go from the message specific TDS type system to openEHR type system. The XSLT transformation to canonical XML solves this problem for us. If you remember what we’ve discussed before in the context of XML, Compositions and TDOs, once you have a canonical XML form of a Composition, you can simply deserialise it to create a Composition object implementation from the Ocean stack. The hidden benefit of a TDS + TDD based approach to getting information into an openEHR system is that it allows creation of openEHR data without having to access any openEHR implementation or any other tools. 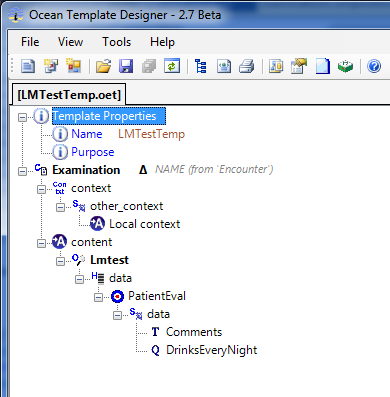 The only tool one would need to create a TDS is the Template Designer from Ocean Informatics, which is freely available. After we have a TDS, we are in the XML technology domain where there are a lot of tools which would let us create a TDD that will be valid based on the TDS. Then if we apply the XSLT transformation to canonical XML, we have an XML file that could have been created through the use of a TDO. This approach allows non openEHR systems to create an openEHR based representation of their data without implementing openEHR for their system functionality. The large tooling base for XML and its platform independent nature allows TDS+TDD approach to be used by a large number of external systems. 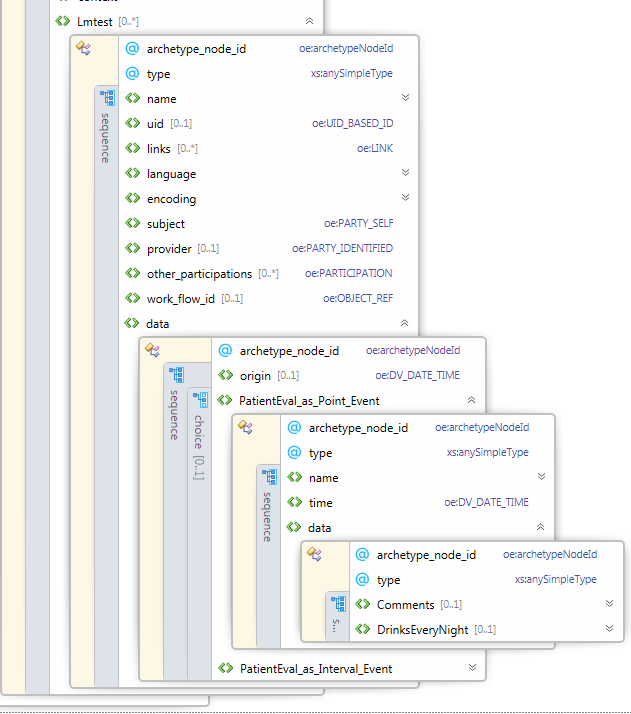 Given that XML is only about data, this approach can not provide the rich functionality of a full openEHR implementation. TDS based validation is also just XSD validation, it would not be able to provide the full validation capabilities of the Ocean stack on its own which is based on the information in the template which in turn is based on the information in the archetypes. Just because a TDD is valid according to its TDS, it does not mean that it is valid according to all constraints in the openEHR model (archetype + template). Therefore the TDD is not a full replacement for an RM implementation or TDO. Still, there is a significant number of use cases where TDD is a good option. You can see that this TDD is a plain XML file with some namespace definitions and a reference to the TDS (LmTestTemp.xsd) which would allow validation of this TDD. This is a test TDD so not all the values in the document make sense. It is possible that there may be a constraint that can not be expressed with the XSD and XML features, and the problem can only be discovered when the TDD has gone through all transformations up until the point there is an attempt to persist it as a Composition. This TDD has been tested though, so we know that it will work through the next steps we’ll discuss. The XDocument type used in line 3 is another standard .NET type, which loads our TDD from the data directory of the skeleton project. Up until line 13, all we’re doing is applying the XSLT transformation to TDD so that we end up with a canonical XML document which we save to disk at line 13. We then load this canonical XML file from the disk to a Composition instance at line 20 and create a TDO from the composition at line 23. This TDO is then committed to a brand new EHR created for a patient with id patId (assigned to a random string before this function is called). This whole process could have been a lot shorter but the code of the function is intentionally explicit and almost bureaucratic to demonstrate steps that might have taken place at different layers. The TDD may have arrived at a web service as an incoming parameter then the web service may apply the XSLT transform and call another web service which may expect a composition so that it can be persisted. Maybe just before the commit a piece of code that checks for a condition for decision support may be required to run, but the code has been written for a TDO which has been generated from the same template that has created the TDS and consequently the TDD. The point here is to show how different options for handling openEHR data can play together in the SDK with support from the Ocean stack. Use of these features with all the options of the XML and related technologies provide a flexible and powerful software development environment. There are many options available through use of XML such as generating summary views, user interfaces, or other representations of data. Downstream generation of JSON, YAML, or different clinical information standards such as HL7 messages are some examples of the possible uses for XML based representation of openEHR data. Now that we have covered the XML related topics, we are ready to take a look at its use to build distributed systems using the SDK through use of web services. Let’s now take a second look at the key use cases we’ve covered previously, this time in a web services based context. krsRepositoryName is the attribute we need match in our knowledge repository creation code. Going back to the function CreateKnowledgeRepository from the SDKWebService project above, svc is our main SDK service class we’ve used before. The web service is just a thin wrapper around it, and it uses it to create the repository and returns the id. With the repository in place, the next step is to insert the opt, this time using the web service. The client side code is using the same reference _svc as before and it is just sending the OPT to the web service. With our fundamental clinical model infrastructure configured, we can again move to creating EHRs for patients. creates the EHR and returns its id. GetPatientId in line 3 just a utility method that generates a random patient id string every time it is called. Finding the EHR using the patient id which is associated with it is easy. As discussed before, a single template and consequently a single TDD may not be enough to cover all the information that will be persisted together. Instead of creating mega models, we would rather commit multiple TDDs based on multiple templates together and using a single contribution is the way to achieve this outcome. the OceanService instance uses a single contribution to commit all Compositions together and returns the ids. The client side code is very similar to previous examples, here we simply use the same TDD file for a number of times, but it could have been different TDD files. Composition XML based use cases are very similar to TDDs, with the extra benefit of not needing XSLT based transforms on the server side. It may seem appear redundant to perform an XSLT transformation when you already have a TDD at hand and there exists a web service method that accepts a TDD, but you may end up applying the XSLT transformation for some other reason. Remember that a TDD is related to a template, and there may be some generic logic that addresses a Composition such as a patient safety check or a decision support rule. In this case, you may need to perform a transformation to a Composition and even modify its contents and it would be convenient to use that Composition to persist data. Just a redirection to SDK service type method. Note that the pCompositionId parameter means that for an update to an existing Composition you need to provide its id. There are multiple ways of getting access to that id based on your use case but an AQL query may be one possible way. This method returns the latest version after the update. That is, a minimum of 2 since an insert creates a version id of 1 automatically. Note that the pUpdateRequest parameter is asking for an array of TDDUpdateRequest, a quite simple type which basically contains TDD content and existing Composition’s id so that the content can be used to update it. An array of this type therefore contains all the content for update along with the Composition ids to find the existing compositions. With inserts and updates covered, it is time we look at how we get our data back using the web services. As discussed and demonstrated before, there is strong support for XML in the Ocean stack, and this support allows XML serialisation of AQL query results so that they can be sent over the wire as web service call responses. When using AQL over the web services, the results for the web service call are compatible with the result set schema designed by Ocean. The xml serialisation of this schema provides a practical view of data when the query is returning fine grained data such as integer or string value at a particular path in the Composition. The example above which returns ids of compositions that match the criteria in the WHERE section of AQL query is another example. These type of highly granular results are easy to map to native data types of the programming environment that is used to access the web service, such as integers or strings in C# or Java. When there is a need to get Complex objects it may be easier to get the whole Composition that fits the criteria as XML as ExecuteAQL method’s output may be a bit cumbersome to transform into an XML document (though it is possible). The result objet res in line 21 is just an array of XML content where each array element is canonical XML of a Composition. Using an AQL query to get the ids of compositions of interest and then fetching the Compositions in XML form is a flexible pattern which can be used in many settings.